forest city here i come! On Monday, I will be heading back to the city of my birth, London, ON, for a week long visit with my parents and brother. I know this is a long shot here, but I’m hoping that someone who reads this is either from London or knows the city very well. I think I stumbled across a London-area food blog a while ago and I can’t remember anything more than that. I’m looking for day trip ideas, things to do and good restaurant haunts. Any takers? In more non-food related news, Cornelius and I have been through quite the traumatic experience regarding our cat, Snoopy. Cornelius’ cat allergies and asthma have gotten steadily worse as of late and early in the week we came to the conclusion to give up the Snoopster. An ad was posted on Craigslist and a notice was posted at the local Union Market. Maybe my ad was too cute, but we received calls and emails right away. Cornelius’ idea of an ad was “Free Cat. Elderly.” — as you can see, he did not want Snoopy to leave! Someone came to visit with her that night and agreed to take Snoopy the next day. Yesterday, at the appointed time, the girl came to pick up Snoopy but had to make 2 trips, so she took some food and the litter with her and said she’d pick up Snoops in an hour. During that hour (yes, there were tears!) Cornelius and I couldn’t help but make up terrible stories about the horrible fate Snoopy would have to suffer in the hands of this so-called seemingly nice stranger. An hour later as promised, the girl returned but Cornelius told her no, that we had changed our minds. Yes, we became flakey cat-people but we couldn’t help ourselves! We couldn’t part with Snoopy!! The girl was very understanding (and truely nice) and she was able to get a car and had Snoopy’s food and litter with her, so Cornelius went down to the street with her and picked up our belongings. I felt so bad about the ordeal (& I should have given the girl a bottle of wine for her troubles but I forgot!) — but the thought of losing the best cat in the world (truely she is!) would have been too much for both me and Cornelius to bear. Phew, Snoopy doesn’t know how close she came! How’s that for a crazy story for my 2nd weekend cat blogging post? And since this is after all, a FOOD blog, here is my contribution to the food blog world: cranberry-walnut scones that I made yesterday for breakfast. This breakfast was meant to be a soothing spot for the day ahead…..oh well, they were tasty! I used Orangette‘s recipe as the base, but added dried cranberries & walnuts instead of crystallized ginger and pistachios (a combination I definitely will try later!). I made these on Christmas morning too, with the addition on orange zest and I forgot to add the zest this time ’round. The zest did certainly add extra flavour, but as is, these scones are still amazing. Easy to make and my first foray into the world of kneading. Who knows, maybe bread will be next! 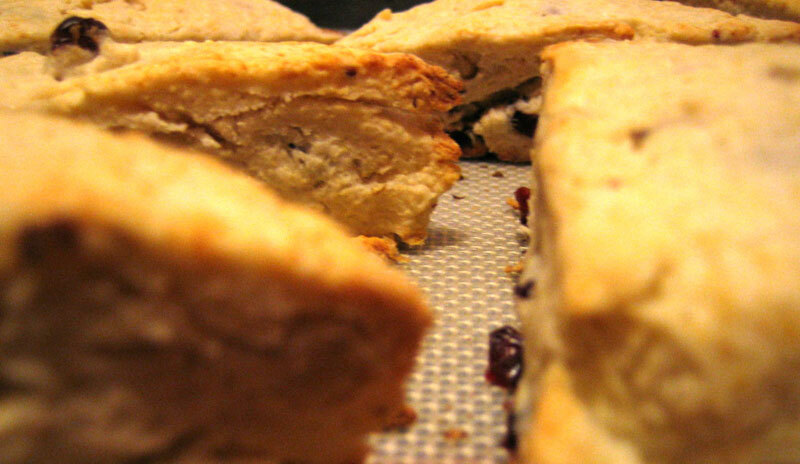 And on an edible note, so glad to hear of your scone success! They look and sound delicious! Whew – what a close scrape for Snoopy!! My husband is similarly cat-allergic/asthmatic so I can relate to Cornelius’ struggle …. but that cat is too damn cute to part with! I am so glad u kept snoopy! Thanks Rorie, I think we’ll somehow manage with C’s allergies & asthma. Snoopy is a keeper! Yup, she sure is a cutie, Crystal. Thanks!! Molly, heehee. I’m glad you liked the ad! And man, those scones are delicious. I thank you and Cornelius thanks you for posting that recipe! I am also glad Snoopy is still with you. She is so lucky to have you two to look after her. I love scones and these look fantastic! 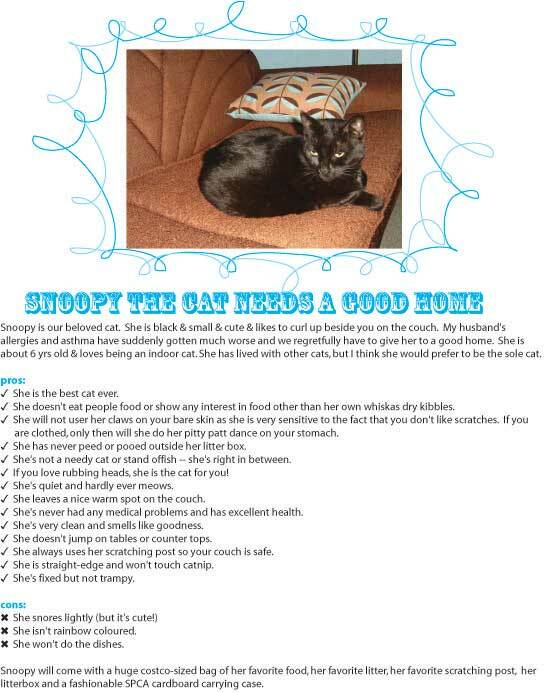 what a great story about your cat! i would feel the same way as you if i had to give up mine. Snoopy is lucky to have you guys! Thanks boo the cat! We’re so happy to have not given up on the Snoops! Rorie, I’ve just posted my list. Joy, thanks for your nice words about Snoopy. We made the right decision!